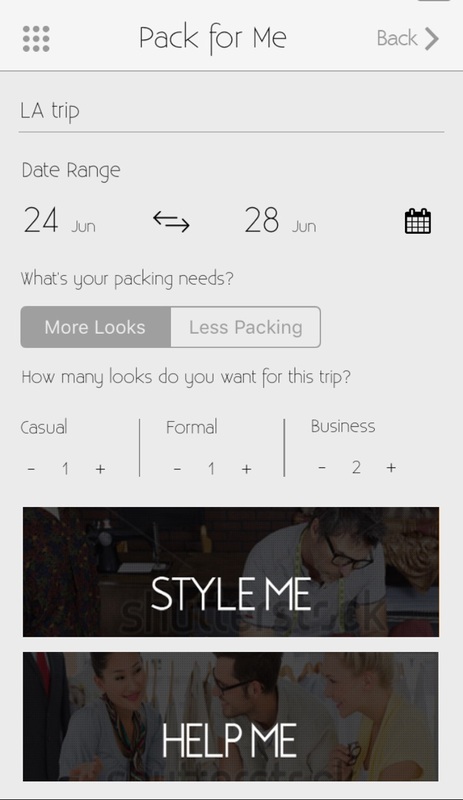 The Travel function within myDiModa, will allow you to select number of days, types of looks, and if you want more variety or less packing, then build an appropriate look for your destination. As a frequent international traveler, I personally understand the need to save packing time and space yet still look stylish for both business and/or leisure. myDiModa, Inc., the global leader in managing men's wardrobes via artificial intelligence, has released an industry first - a fashion travel packing assistance feature. myDiModa Travel will provide a quick approach to help men pack more efficiently, with fewer items, that provide maximum stylish possibilities for their travels - business or pleasure. myDiModa Travel users will select the length of the trip, number and types of looks needed, as well as the option of either “more looks” or “less packing.” Within seconds, myDiModa Travel will provide packing suggestions by using complex logic, algorithms and technology. This innovative fashion app for men has the unique patent-pending ability to automatically create stylish outfits from the users' existing wardrobe. Driven by images taken by the user, this sophisticated app uses proprietary algorithms for color and pattern recognition to recommend fashionable looks for any occasion. myDiModa has an up-to-the-minute, built-in capability to harmonize clothing items to ensure pieces will enhance a user’s overall style before purchasing directly from online shopping sites, such as Amazon.com, Asos.com, and StyleShop.com. To download visit the Apple App Store at https://itunes.apple.com/us/app/myDiModa/id951504559?mt=8. or Google Play Store https://play.google.com/store/apps/details?id=com.mydimoda. For more information on myDiModa visit http://www.myDiModa.com. Headquartered in Dallas, Texas, myDiModa, Inc. was established in 2014 by Terrence Carroll. Frustrated with the time-consuming (and often unpleasant) process of having to figure out the best outfits for work and play, he created the innovative fashion app - myDiModa.